Line 1 & 2 – Sarah Brown, age 2, and Harriett Brown, age 7 mo.s end the enumeration for Hopkins twp. ALDRICH, J. A., 48, F, Penn. ALDRICH, Chauncy, 22, M, Farm laborer, Penn. ALDRICH, Owen, 20, M, Penn. ALDRICH, Frances A., 18, F, domestic, Penn. ALDRICH, J. H., 19, M, Farm laborer, Penn. ALDRICH, Adeline, 18, F, Domestic, Penn. ALDRICH, Mary J., 9, F, Penn. KILROY, Albert, 12, M, Wisc.? CURTIS, G. W., 38, M, 2000/445, Conn.
LUTYENS, Nicholas, 30, M, Farmer, 960/150, Penn. LUTYENS, Elizabeth, 73, F, Domestic, PV/45, Penn. GRAY, Ann M., 40, F, Penn. HINMAN, Jane, 19, F, Domestic, Penn. HELLYER, Ezra, 42, M, Farm laborer, PV/300, Penn. BELL ? or BALL, John, 38, M, Farmer, 1800/200, Mass. BELL ? Caroline, 37, F, Conn.
CHAPIN, M. W., 41, M, Farmer, 1320/1200, Mass. CHAPIN, Desire L., 40, F, Mass. CHAPIN, Catherine O., 16, F, Domestic, Mass. CHAPIN, Harriett J., 14, F, Mass. PLUMBY, John, 8, M, Mass. PLUMBY, Charles, 7, M, Mass. Between 1680-1763, Illinois was under the control of France. Between 1763-1783, Illinois was controlled by Great Britain. Between 1800 and 1809, Illinois was considered part of Indiana Territory. On 3 March, 1809, Illinois became it's own territory. Federal Illinois census records begin in 1820 and were enumerated every ten years. Census years available to the public are: 1820, 1830, 1840, 1850, 1860, 1870, 1880, 1900, 1910, 1920 and 1930 & 1940. Soundex code indexes for Federal Illinois census records are available on microfilm for census years: 1880, 1900, 1910, and 1920. 1890 Federal census schedules (including the Veterans and Widows census) were completely destroyed by fire with the exception of a small fragment of McDonough County ED 174. 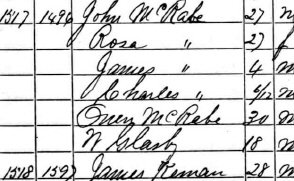 Illinois state census records were enumerated in 1810, 1820, 1830, 1835, 1840, 1845, 1855 & 1865. See IL State Census for more info. State censuses were taken in 1820, 1825, 1830, 1835, 1840, 1845, 1855, and 1865. Unfortunately only the 1820, 1855, and 1865 ones have survived reasonably intact. Most of the county returns for 1825, 1830, 1835, and 1845 are missing and nearly half of the 1840 state census has been lost.